or via the specially designed app. if their child might need support with their vision. and tested our eyesight while following Zoe's zoo adventures. 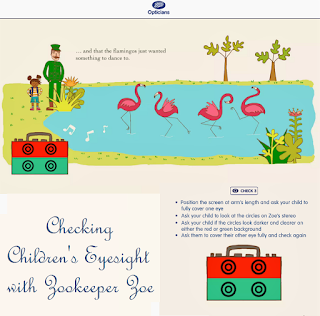 and an easy to follow guide for the eye check activities. as they are intended to be like a game. and every two years afterwards. and is not intended to replace a comprehensive eye check. -courtesy of the NHS- for all children up to 16 years old. so often they are free of charge. Zookeeper Zoe is free and 350,000 copies will be available as from 16 March 2016 in Boots stores across the UK. You can book online a free of charge eye check for children up to 16 years old.